An important process of secessionist politics is happening right at SEN’s doorstep. The Scottish Nationalist Party (the SNP), now in power ‘up north’, has reached an agreement with the Westminster government that it can go ahead and hold a referendum with regards to Scotland’s independence. This spring, the Bill for a Referendum is being presented at the parliament in Edinburgh. The gaze of Europe’s other secessionist movements cannot but be fixed on what happens next. 2013 is the year this process will play out in the media and in the chambers of government. 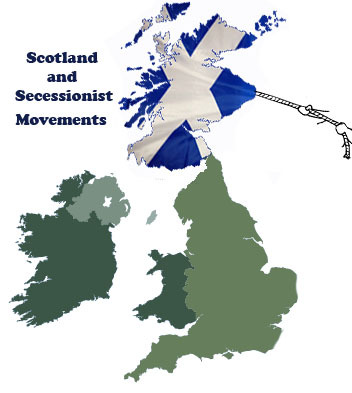 Hence, we present our new series on Scotland and secessionist movements in which we will share key documents relevant to this bit of nationalist politics. We will point you to the best sources of information and will reflect on the implications of what is happening right now in the United Kingdom. To start this series we present some of key sites where you can find information on this unfolding political process. The Scottish Nationalist Party’s official website – the party have initiated the campaign. This entry was posted in Series and tagged reference, Scotland, secessionistpolitics, UK. Bookmark the permalink.